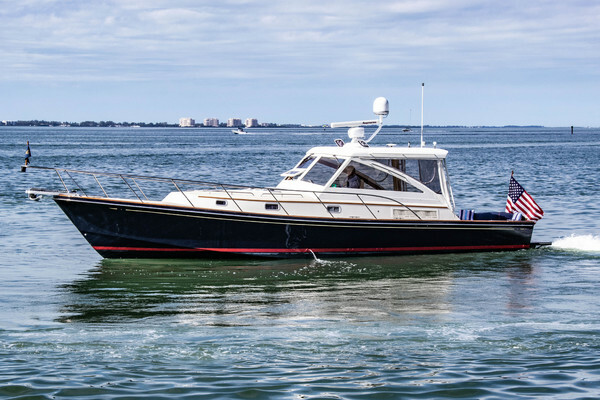 The 31 BLUE SEAS DOWNEAST STYLE EXPLORER was built from true craftsman in Maine at BLUE SEAS MARINE. The TORTOISE has a semi-displacement built downeast hull. The boat was built with a full run keel with a protected rudder. The flare of the 31 Blue Seas makes for a dry comfortable ride. The current owner is a knowledgeable seaman and has maintained and cared for his boat. West Florida Yachts would love to guide you through a personal showing of this 31' Blue Seas Explorer 1986. This yacht for sale is located in Cape May, New Jersey and priced at $59,500. For a showing please contact us by filling out the form on this page and we will get back to you shortly! TORTOISE accommodations are typical for a sedan style motor yacht. Starting from the bow you have the V-berth with filler cushion. P&S shelves over the berth and stowage below. There is a quarter berth to the port side. The full head with shower sink and toilet are on the starboard side. Up the steps is and on the starboard side is the large helm with great visibility. Starboard and aft is the full galley and to port is a large couch for sitting or used as another bunk. The salon door leads to a roomy cockpit for fishing or diving. TORTOISE is powered by a single Volvo Penta FWC TAMD40 turbocharged six cylinder 165HP diesel engine with 2050hrs time since new. This is turning a fully skegged protected 18"x15" 4 blade propeller with a 1 1/2" SS shaft. There is a spare propeller. You have a Racor 900fg diesel fuel filter system. The steering system is hydraulic and the throttle and gear is a single lever morse control. There are seacocks and strainers for the main engine and all pump inlets. There are three separate water tight bulkheads and each has its own automatic bilge pump. TORTOISE is a very nice well-built very fuel efficient DOWNEAST STYLE boat. It would make a great dive boat or coastal cruiser.